Good afternoon! I hope you are all having a great hump day! Today I have a new to me brand to share with you guys. 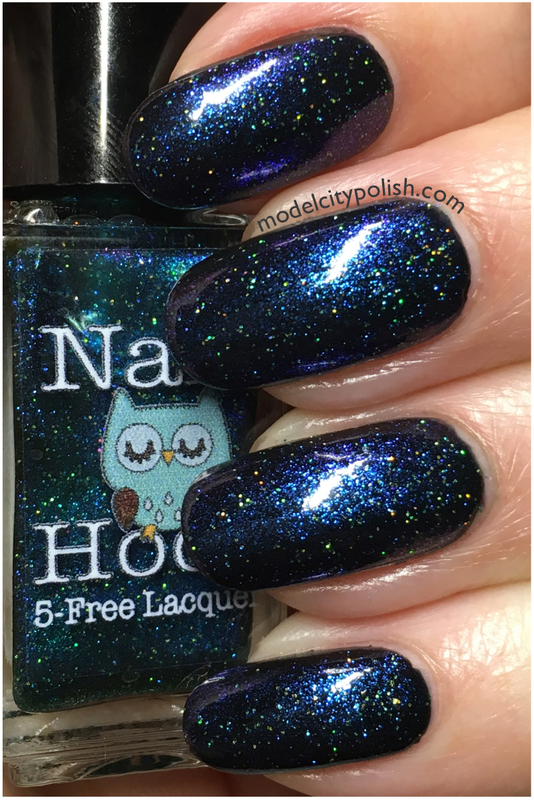 I have been checking out Nail Hoot from afar and a few weeks back she ran an amazing promo that gave me the opportunity to try them out. 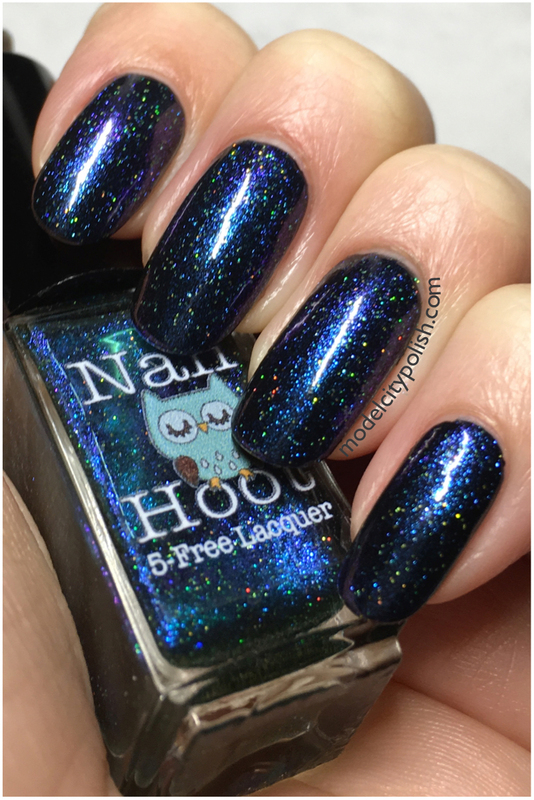 Nail Hoot had a flash sale where you got one mini for free, just pay shipping. I jumped as quickly as I could and decided to go with Genesis as my first Nail Hoot. 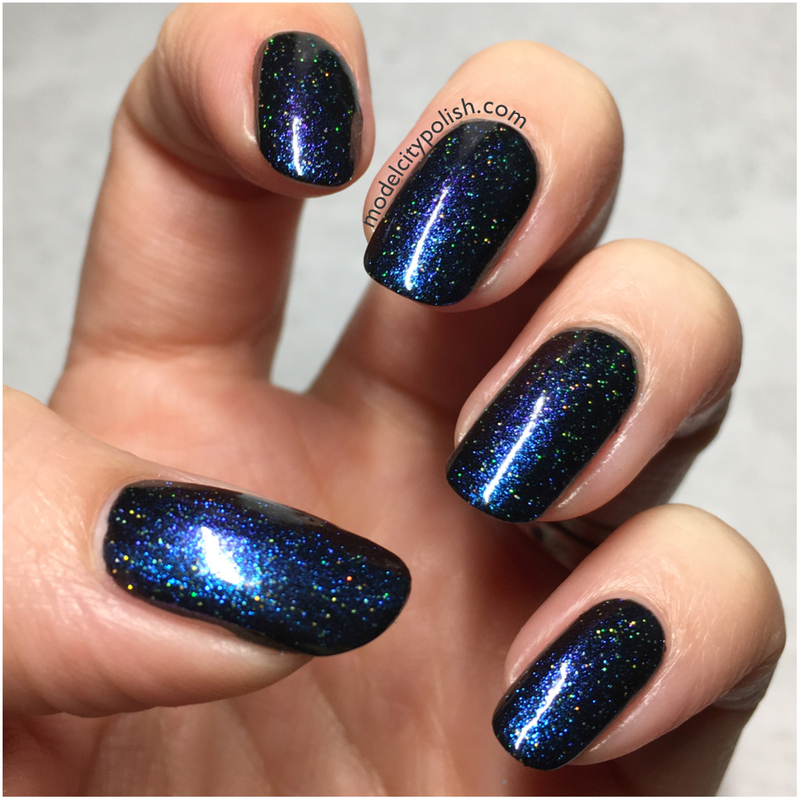 Genesis is a a sheer blue tinted base filled with blue to purple shimmer and micro flecks of holo glitter. This blend was a little too sheer for me so I decided to wear this over Sinful Colors Black on Black. The end look was amazing, simply galaxy manicure! 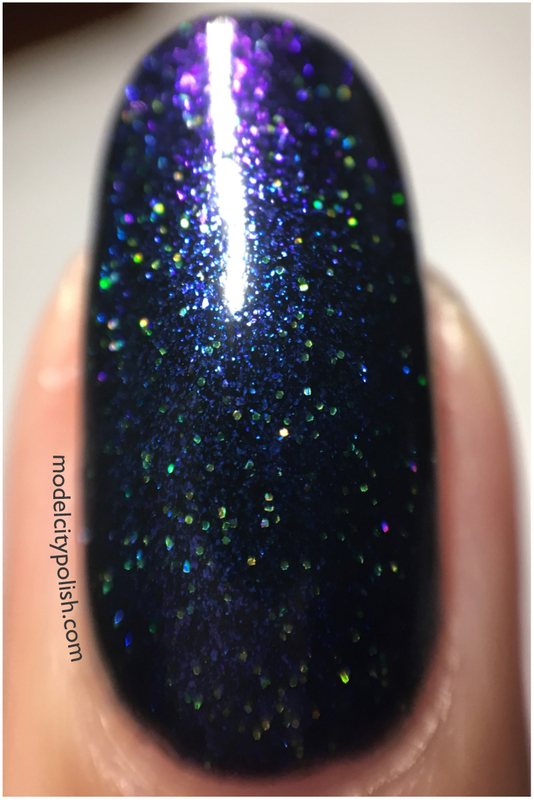 In my photos I am wearing one coat of Genesis over black and sealed with a clear top coat. 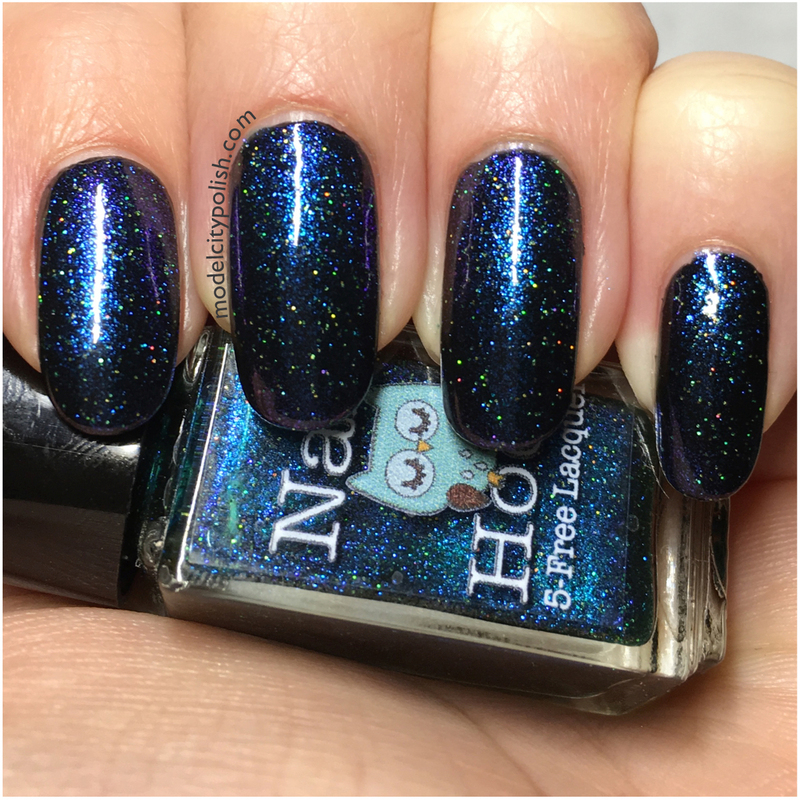 So what do you guys think of Genesis from Nail Hoot? What is your favorite from them? Overall I was pretty pleased with my choice. 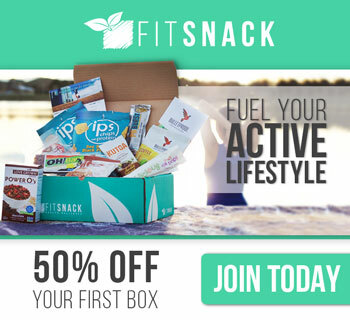 I certainly look forward to trying out a few more. You can find more lovely lacquers via Nail Hoot and be sure to give them a follow on Instagram for up to date info. Thank you so much for stopping by today and I will see you all again tomorrow. What a pretty polish. I love the blue. I never think to put a blue over black. It was perfect over black and so glad I went with that option instead of multiple layers. This is really pretty over black! Blue polish is my jam so I love this! It would make an awesome base for galaxy nails. Boo for sheer but yay for a good black base! 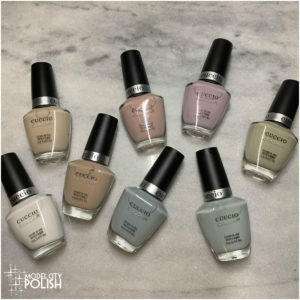 I have several polishes where they really need a good undie and they are just too pretty to let go! I totally know what you mean! I have quiet a few lacquers that are only good over accenting base colors but the extra work makes them totally worth it. I love the cute labels on these bottles…and the polish is GORGEOUS too! I love their labels too!!!! The black base was a great idea here! looks good! this is an usual shade. It looks like a galaxy, almost. This looks amazing over black! Now I think I need this one, I have the holo version. I think over black is the only way to go! Instant galaxy!! 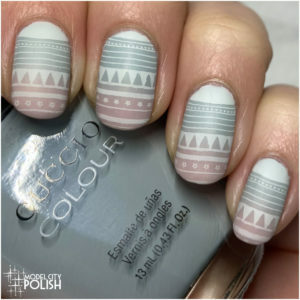 Gorgeous swatch and polish. It’s really beautiful swatched over black. Oh my goodness, so beautiful! It looks like the night sky! 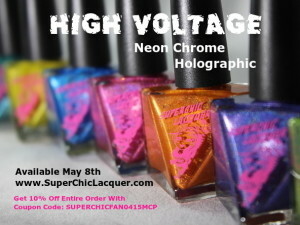 I always say I’m not a big fan of glitter nail polishes….but I would totally make an exception for this one!